Five years ago, things were awesome and Emmett, (Chris Pratt) Lucy, (Elizabeth Banks) Batman (Will Arnett) and the gang had just saved Bricksburg from total destruction. Now they face a foe from the Sis-star system that destroys everything they've worked so hard for. When all of Emmett's friends get kidnapped, he goes off to try to save them and runs into All The generic action heroes Chris Pratt has played Rex along the way. Ahh, the original Lego Movie. Back in 2014 when Chris Pratt didn't annoy me, they had a hilariously stupid song, and the film was funny and surpassed everyone's expectations. Now we're in 2019. Chris Pratt is annoying, their theme song is stupid without the funny, and the only thing that remains great is the animation. This is a sequel that's not worth the theater view. I realize I had some bias going into this because ever since Jurassic World came out I have not been able to stomach Pratt and unfortunately a big chunk of this movie is Pratt talking to himself since he voices two characters. 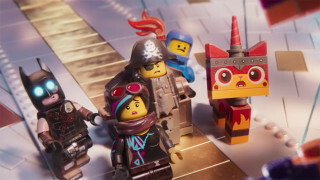 Unlike the original, Lego Movie 2 resorts to several musical numbers that don't benefit the story telling, but are there simply because it feels like the writers couldn't think of anything else. They make the film feel longer than necessary and by the time we got to the 3rd act, I was practically begging for this to be over. Even though this film is only 90 minutes long, It felt like it was over two hours. The animation is still very good, but that isn't enough to carry the tired plot. The ultimate lesson they teach is cute and I felt like it shouldn't have been this hard to tell a story around it. The laughs were so few and far between. I did worry that the sequel was going to be a flop! I reeeeaaaaally loved the original though so I'm trying to stay optimistic! It can't be as bad as Jurassic World 2...can it? I didn't even bother with that mess. I hated Jurassic World. NOOOOOOO!!!! I have been so excited to see this but feared this would be the case, especially since hearing the awful new song. Even my kids were not having it. LOL! I was let down by Incredibles 2 because it felt like it didn't try at all to do anything different. I quite liked Wreck it Ralph, but mostly because the Princess scene was almost too perfect. That was the only part of Wreck it 2 that I liked. That scene was amazing, the rest flopped for me. I still haven't seen this. I loved The Lego Movie and liked Lego Batman. But I did think Lego Batman was a little exhausting and more hyperactive with its humor. I've heard this movie is more in the Lego Batman vein. Oh GAWD that's terrible. I kind of hated LEGO Batman, which is why I was excited for this because I hoped it would be a return to form. This is a lot more like Lego Batman structure wise, but worse because Batman actually had a consistent plot that didn't need filler like this one does. I'm going to wait for it on TV. I wanted to see it as I enjoyed the first film and LEGO Batman but I too have been annoyed by Chris Pratt. Especially as he's now chosen to get into a fight with the Tiny Canadian Destroyer. He's not going to win that fight. Lego Batman is soooo much better than this. Couldn't agree more. This f--ker was begging me to fall asleep during it (which I may or may not have done). My kids dug it...so there's that. They should just give Supes and Green Lantern their own spin-off and call it a day. No kidding, they could probably carry a film without resorting to musical numbers that don't quite fit. I didn't even write a review for this because there so little to say. The film just sort of plays, finishes and then you leave the cinema never to give it a second thought. In the end, I jst got bored like you did. I was debating if I should see this in the cinema, but I'm going to skip it for now. I want to be excited for it because I adored The LEGO Movie, but I'm just not feeling this one anymore. This is definitely a DVD watch. I loved the original too but this can't compete.